Environmental activists will formally set-up a Dublin branch of Extinction Rebellion at an event in the capital tomorrow evening. The Extinction Rebellion Dublin group will meet at Third Space Cafe in Smithfield tomorrow evening to cement the group’s status as one of many branches of the movement popping up across Ireland. The movement that formed in England late last year calls on citizens to use peaceful civil disobedience as a way to rebel against the climate inaction of its Government. The Dublin affinity group is demanding that the Irish Government declare a climate emergency, inform the Irish public about the scale of the ecological crisis, and enact legally binding policy measures to reduce emissions to net zero within the next few decades. To date, Ireland remains well off track to meet its 2020 and 2030 climate targets. The 2019 Climate Change Performance Index released in December also singled out Ireland as the worst performing country in Europe for addressing climate change for the second consecutive year. Dr Ciarán Ó’Carroll of Extinction Rebellion Ireland told The Green News that Extinction Rebellion Dublin will protest the Government’s inaction on climate change starting with an international week of action during the week of 15 April. “Our first action will be to take part in International Rebellion week where activists across the globe will blockade the streets of capital cities until governments start taking climate catastrophe seriously,” he added. Irish Extinction Rebellion activists marked World Wildlife Day last month with a mock Funeral for Humanity in the centre of Dublin to highlight the planet’s extinction crisis. 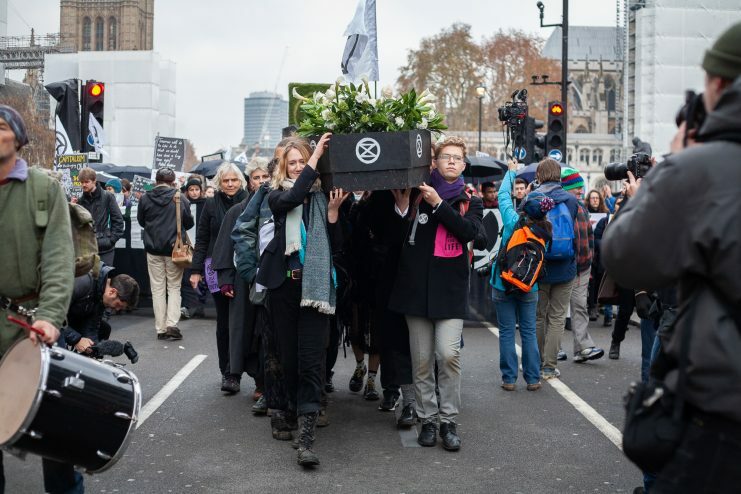 The Extinction Rebellion movement began with 10 people in the UK last summer and rose to prominence in November 2018 when thousands of activists blocked London bridges, disrupted traffic, and glued themselves to public buildings. Most recently, semi-naked Extinction Rebellion protesters interrupted a Brexit debate in the House of Commons and glued their hands to the public gallery glass.